Permanently Delete Data from iCloud: All iOS File Types Supported! As data keeps on getting stored on your iCloud, there are chances that a whole lot of storage space in your iCloud will be taken which in its own have some disadvantages. Do not forget that lack of space in your device can cause it to become sluggish and reduce the performance, hence, it is always important to manage iCloud storage space effectively. Let us look at how to delete data from iCloud. There are a lot of backups stored in iCloud that may not be needed. In fact sometimes there are even duplicate backups since iCloud uses device ID to store backup. In this case, it is important to delete these data from iCloud. To do this, go to Settings > iCloud > Storage > Manage Storage. 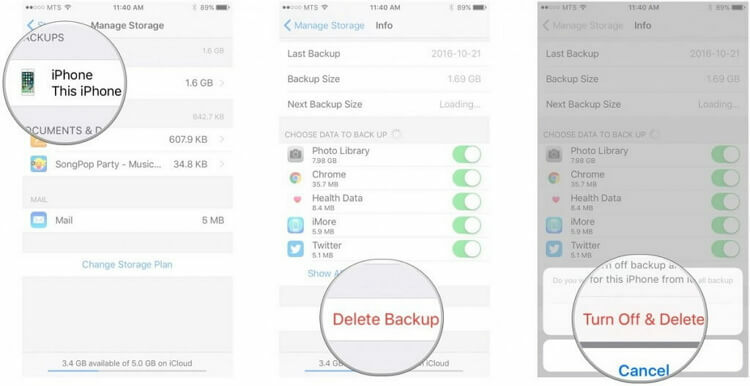 Under BACKUPS, tap on your device name and tap on Delete Backup. Tap "Turn Off & Delete" to confirm. All the backup data for this iPhone will be deleted from iCloud. Let’s not forget that all iCloud accounts get iCloud mails configured to your iOS. However, it is important to note that whatever mails you receive get stored and accumulates over time and this go a long way in eating up valuable space against your iCloud storage quota. The truth is that it is important to clean your iCloud mail periodically at least to create space. Step 1: Open "Mail" app on your iPhone. Tap "Edit" and check unwanted emails, then tap on "Trash All." Step 2: Go to "Mailboxes" and tap on "Trash" category. Tap "Edit" and then "Delete All". Once done, the mails will be deleted from iCloud. In order to save iCloud space and protect iCloud privacy, you should to permanently delete data from iCloud. There are many ways you can use to delete data from iCloud but the best way is to permanently delete using the awesome iMyFone Umate Pro or iMyFone Umate Pro for Mac. 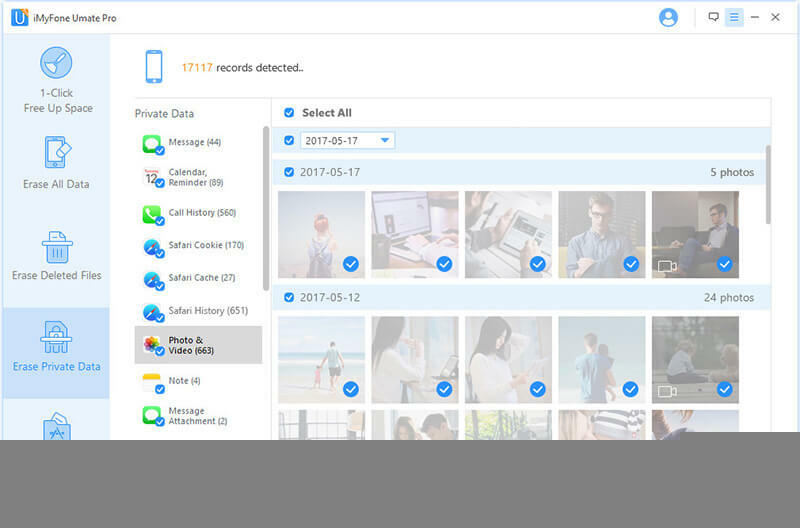 This software is an All-in-One solution that offers incredible space saving solutions and privacy protections to your iPhone and iCloud. It applies advanced overwriting technologies to permanently delete data from iPhone and also iCloud, 100% unrecoverable, which gives you an ideal solution when protecting your private information is a priority. Erase All Data - It can erase all data from iCloud and ensures that all erased data is 100% unrecoverable. 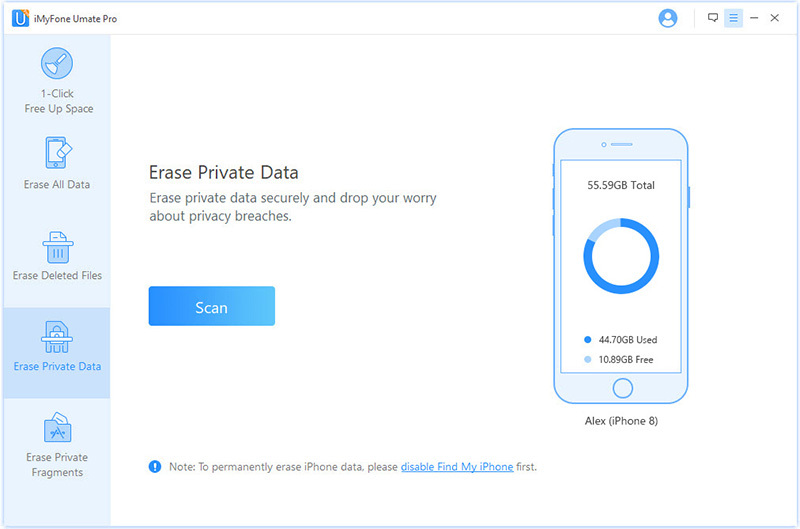 Erase Private Data - You can preview and selectively delete iCloud contacts, calendars, reminders, Safari, notes, photos, WhatsApp, WeChat, etc. beyond recovery. Erase Deleted Files - Simply deleted files can be recovered but this mode can view previously deleted iCloud data and make them completely gone. Erase Private Fragments - Third-party app fragments stored in iCloud will be completely removed, like Snapchat, Facebook, Twitter, Viber, Chrome, etc. 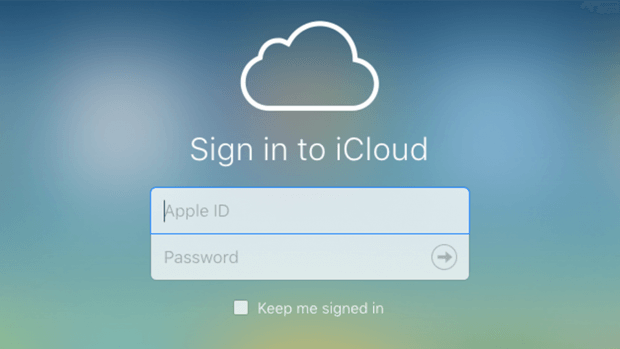 How to Delete Data from iCloud Permanently? Step 1: Connect your iPhone to computer and launch iMyFone Umate Pro. Step 2: Choose the erase mode that solves the problem, like "Erase Private Data." Click on "Scan." Step 3: Preview and select the data you want to delete and click on "Erase Now" button to continue. Once done, the data will be permanently delete from iPhone and also your iCloud.